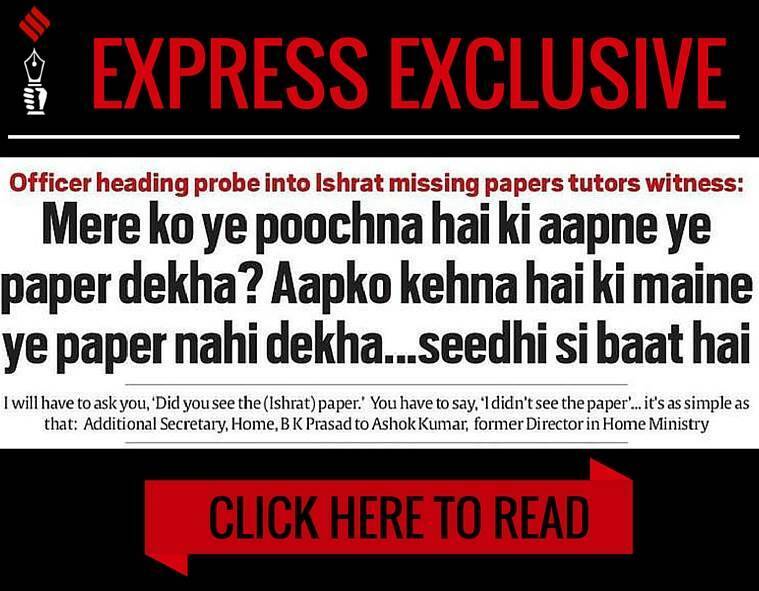 A political firestorm erupted Thursday after The Indian Express reported that B K Prasad, the officer heading the Home Ministry probe into the missing papers in the Ishrat Jahan encounter case, tutored a witness. The Congress said the report proved that the probe was “fixed” and was a “farce exercise”. It asked the Supreme Court to intervene to ensure that trial in the case was not derailed by the BJP government and claimed that the Prime Minister, Home Minister and the government had “lost all credibility”. Leaders of five Opposition parties condemned what they called an attempt to get a clean chit for powerful people in the 2004 fake encounter case. CPM general secretary Sitaram Yechury said “the compromised inquiry by the Home Ministry, after the Home Minister’s assurance to Parliament, raises serious questions that some big names are being protected by the BJP government at the Centre” and alleged that “tutored witnesses, compromised inquiries, and non-existent ‘clean chits’ are the hallmark of this BJP government”. In a joint statement, Mohammad Salim (CPM), K C Tyagi (JD-U), D Raja (CPI), D P Tripathi (NCP) and Manoj Jha (RJD) said that “in the season of securing clean chits, one can mark a clear misuse of official machinery to ultimately clear the names of some powerful people in the Ishrat Jahan case”. “Ever since the assumption of power by Prime Minister Narendra Modi, an attempt has been afoot on the part of Sanghis to circumvent the constitutional machinery to ensure that justice is not delivered in certain cases. First, they did it in Gujarat and now they are replicating it at the national level,” the leaders alleged. Addressing a press conference, the Congress attacked the government, saying “a dirty tricks department was functioning at the highest level of the government”. 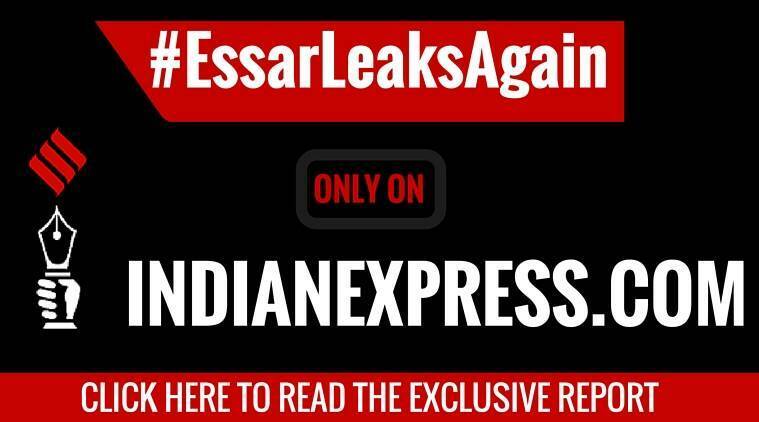 Anand Sharma, senior Congress spokesperson, said the revelations in The Indian Express report are “serious”. “Ordering an inquiry and then fixing an inquiry… If people can be punished for match-fixing, then this is far more serious. This government is not only framing opponents but also fixing inquires, fudging documents and making important documents disappear, busy selectively leaking documents,” he alleged. “This is not an issue which can now be left to this government. The Prime Minister, his Home Minister and the government have lost all credibility. They do not have even a fig leaf to justify what they have been saying. We know that they are thick-skinned. They do it deliberately. I will not be wasting words asking them to apologise. It is for the Supreme Court now to ensure that those who are guilty are adequately punished,” he said. He said the real issue was the attempt to deflect attention from the trial in the Ishrat Jahan case. He sought the Supreme Court’s intervention to “ensure that the trial which was being monitored by the High Court is taken to its logical conclusion and this government is not allowed any more to derail the trial and the process of justice”. Sharma said revelations that have come into public domain about the “cosmetic inquiry” that was being conducted by the Home Ministry on the orders of the Home Minister show that it was a farce. “It was a fixed exercise. This entire drama was enacted and the issue of two affidavits brought to the fore, which had nothing to do with the merits of the case, to deflect and divert attention from the issue that was before the Gujarat High Court and to derail the entire judicial process, to shield the culprits and to defame political opponents,” he alleged. “It is an elaborate exercise that has been undertaken and it’s very clear now that it was not that there was a serious probe going on. Those of us who are familiar with the functioning of the Government of India and with the filing of notes and sensitive documents know that correspondence between the country’s Home Secretary and the Attorney General do not disappear. In any case, the copies of the affidavits are there before the courts and anyone can access that,” he said. Yechury said the Ishrat Jahan encounter case is not an ordinary case as “it is connected to some of the biggest political names in the country today”. He said “serious questions are being raised about the delivery of justice under the present regime” and argued that “the Malegaon probe by the NIA, which overturned previous investigations done by itself, is yet another pointer in this direction”. “It is hard to expect justice in such an environment when the Home Minister’s personal assurances to Parliament lead to such a situation. The wires in this case lead straight to the top, and the top leadership of the government must answer whom they are protecting in this false encounter case,” Yechury said. The Aam Aadmi Party (AAP), meanwhile, alleged that while the previous UPA government tried to cover up the case, the NDA government was “treading the same path”. “If the main official who is heading the inquiry is tutoring witnesses, then what hope is there for a fair probe? Who do the families turn to? The entire country wants to know the truth behind the mysterious encounter,” said AAP Delhi convenor Dilip Pandey.